We often get asked by clients whether it’s worthwhile having a LinkedIn profile. With social media, we generally advise to start small. Get the hang of one platform before you add another. But LinkedIn is one platform worth utilising. At last count, LinkedIn had over 500 million, and by some reports, it also powers 50% of the world’s professional hires. LinkedIn isn’t a tool that brings you face to face with prospective clients on a daily basis. It’s not a B2C (business to consumer) marketing tool. Instead, it brings you into contact with other businesses, business owners and peers. LinkedIn amplifies opportunities to connect with other professionals, which can have many benefits to your business. One of the primary ways professionals use LinkedIn is to share information, start discussions and connect with like-minded people. You can join one of the many groups possibly relevant to your business such as Building Design/BD, with over 12,000 members, or smaller, more specialist groups such as Green Building. Or, you could start your own group. According to LinkedIn, group participants get four times the number of profile views. On LinkedIn you can also follow professionals or companies you’re interested in learning more about. Their posts will show up in your news feed. LinkedIn’s Pulse includes ‘Influencers’ such as Bill Gates, Arianna Huffington and Richard Branson. Apart from connecting with peers, you can also research clients before meeting them to increase the chances of hitting it off. Remember, they’re probably using LinkedIn to assess you, too. LinkedIn is the place to advertise for professional staff and to job hunt. With a reported average of 10 million active job posts, if you’re job hunting you can follow businesses you’re interested in. Their job openings will pop straight into your newsfeed; you apply through LinkedIn. Job hunters also get a feed of jobs tailored to the skills listed on their profile. This means if you’ve got building design skills, jobs seeking building design skills in your region will automatically come into your feed. This also makes finding the right applicants easier. LinkedIn automatically selects candidates with the right skills for you. LinkedIn fosters word of mouth. We’re betting a large part of your business still comes through referrals. You can search through your connections to see who you know, or who could refer you to someone they’d recommend for your business needs. You can also recommend people if you see someone looking for the skills you know a contact has. In turn, people may find and refer you. On LinkedIn you can also post recommendations and give and receive endorsements. This means you could post a glowing review of a customer you designed a home for. Last, but certainly not least, your profile must link to your website and social media. This helps people find your business and generates traffic to your website, boosting your page rank and making you easier to find on Google. Will it bring you business? Short answer: Yes. Clients have certainly come to us through LinkedIn. And remember just one small job will repay the time you invest many times over. Next month, we’ll take a look at some steps to help you build a better LinkedIn profile. 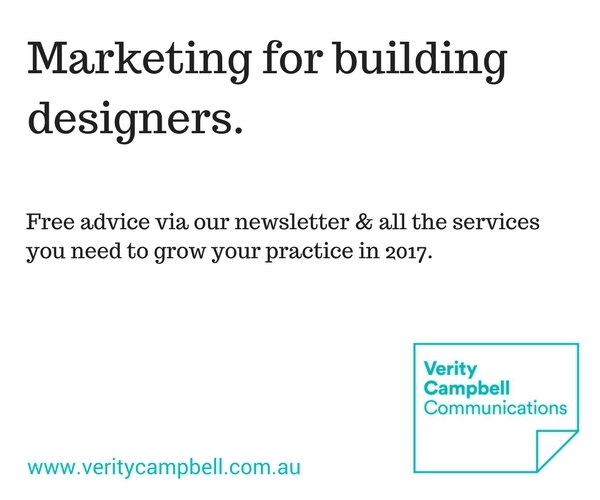 Writing, marketing and communications for design and related businesses. Join our weekly newsletter for new ideas, tips and advice.